Karnataka Assembly floor test LIVE updates: According to reports BS Yeddyurappa might resign if he does not have enough numbers to prove majority. The Congress has released another audio tape, this time alleging that BS Yeddyurappa offered ministerial post to MLA BC Patil. Meanwhile, Congress MLAs Anand Singh and Pratap Gowda Patil have been allegedly kept captive in Gold Finch Hotel in Bengaluru. Additional Commissioner Seemanth Kumar Singh along with his team are leaving for the hotel, the report said. The Supreme Court, earlier on Saturday, turned down Congress and JD(S) 9; plea against the appointment of KG Bopaiah as the pro tem Speaker KG Bopaiah. However, it allowed the live telecast of the trust vote. Ahead of the trust vote, JD(S) leader HD Kumaraswamy said that it wasn't an important day for him. "The important days will come in future. Till 4 pm, BJP will try to poach our MLAs. All the MLAs are together; no one is going to go to the other side," he said. The Supreme Court directive on Friday to hold a floor test in the Karnataka Assembly on Saturday led to heightened political activity in the state, with the Congress-JD(S) post-poll alliance sure of Chief Minister BS Yeddyurappa losing the battle and the BJP sounding confident to sail through. The court junked Attorney General KK Venugopal's suggestion that the floor test be c onducted through secret ballot. The court also barred Yeddyurappa from taking any policy decisions till the floor test. The court also restrained the chief minister from nominating an Anglo-Indian member. 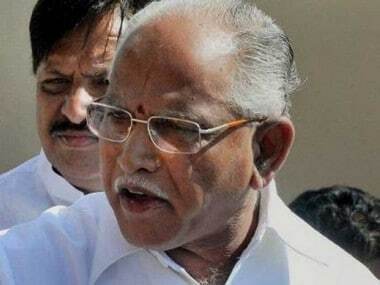 Followi ng the apex court order, Yeddyurappa told reporters in Bengaluru that he was confident of proving his majority in the House. "We welcome the Supreme Court order of floor test at 4 pm on Saturday. We are confident of proving our majority," he said. Union Human Resource Development Minister Prakash Javadekar, who was election in-charge of the BJP in Karnataka, also expressed similar confidence. Bopaiah, 62, is a three-time legislator. He was speaker during the BJP rule in the state from 2008-13. Surjewala said Bopaiah has been indicted by the apex court. "People of Karnataka are determined to foil and defeat these evil and nefarious designs of Governor Vajubhai Vala, Narendra Modi and Amit Shah," he said. Party spokesperson Abhishek Manu Singhvi said the BJP will be defeated in floor test and that Yeddyurappa had exhibited "desperation" in becoming the chief minister. Singhvi referred to Venugopal's suggestion and took a dig at the Modi government, saying that trust vote is never conducted through secret ballot.